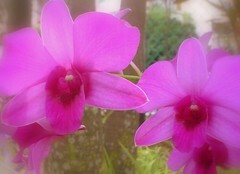 Everyday the orchids near my house greets me on my way. I'm grateful to them for their smiles. The beauty touches me, overflows me with joy and refresh my feelings that 'life is truly beautiful'.